Class 33: 33207 in West Coast Rail livery at Stoke Pound 23rd August 2008. 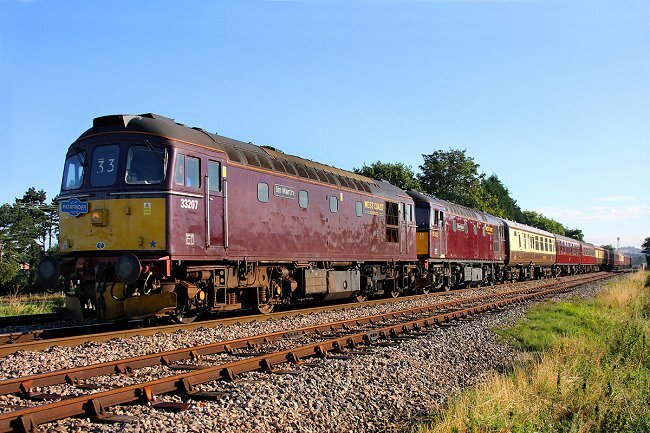 Built 1962 by BRCW works number DEL163 as D6592. Photograph Nick Broome. 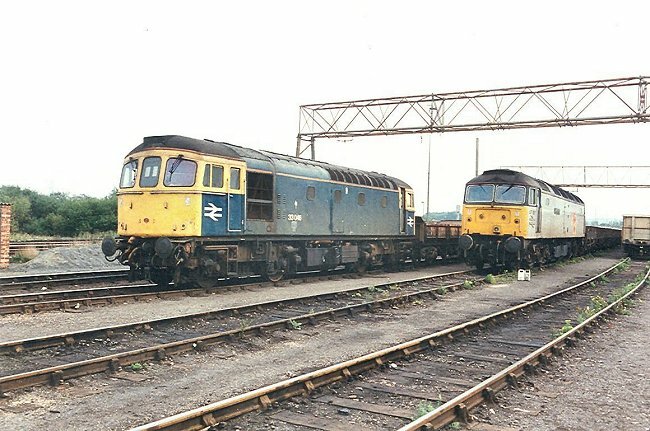 Class 33: 33046 in blue livery with 47317 in grey livery at Hoo Junction 24th September 1989. The yard's former overhead electrification gantries are clearly visible. 33046 was built 1961 by BRCW works number DEL156 as D6564. 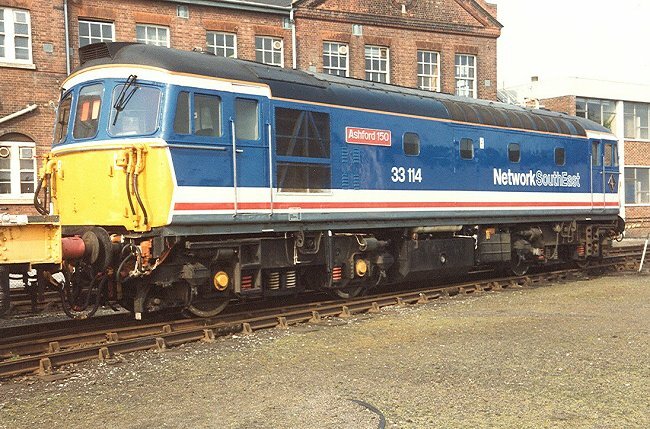 Class 33: 33114 "Ashford 150" in Network South East livery at Eastleigh 27th September 1992. Built 1960 by BRCW works number DEL124 as D6532. Was at one time named "Sultan". 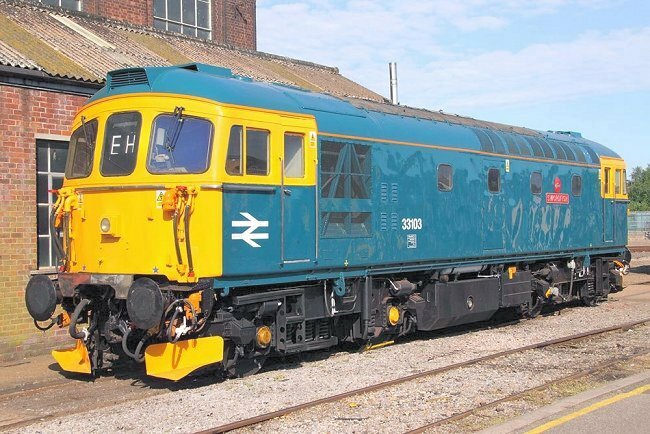 Class 33: 33103 "Swordfish" in blue livery at Eastleigh 25th May 2009. Built 1960 by BRCW works number DEL106 as D6514. Photograph Nick Broome. 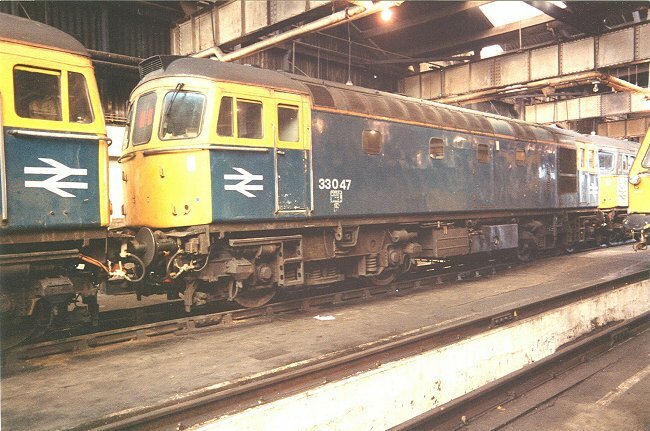 Class 33: 33006 in blue livery at Eastleigh 27th September 1992. Built 1960 by BRCW works number DEL98 as D6506. 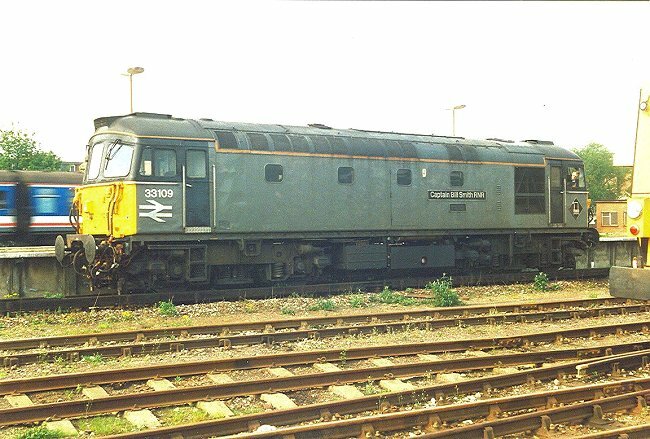 Class 33: 33109 "Captain Bill Smith RNR" in grey livery at Woking 29th April 1994. 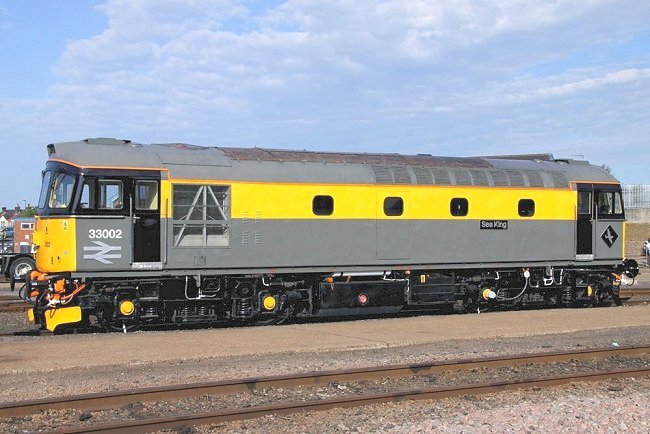 Built 1960 by BRCW works number DEL117 as D6525. 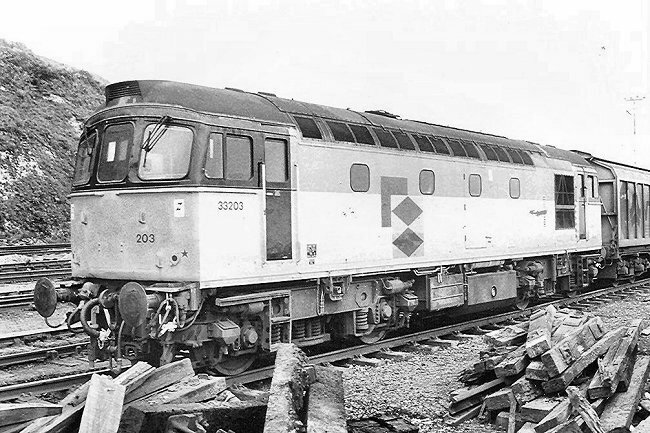 Class 33: 33203 in grey livery at Dover 1st May 1989. Built 1962 by BRCW works number DEL159 as D6588. Later allocated number 33301, but number not carried. Class 33: 33025 in West Coast Rail livery hauls train 1Z82 from London Waterloo to Weymouth at Coxes Mill, Addlestone, 6th September 2008. Built 1961 by BRCW works number DEL135 as D6543. 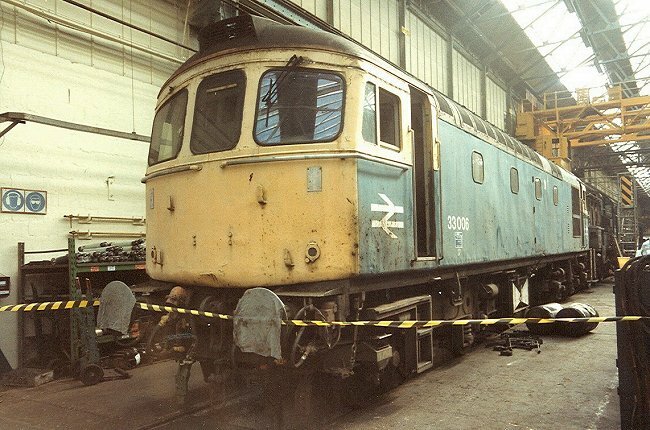 Class 33: 33047 in blue livery at Hither Green locomotive Depot 20th March 1990. Built 1961 by BRCW works number DEL169 as D6565. 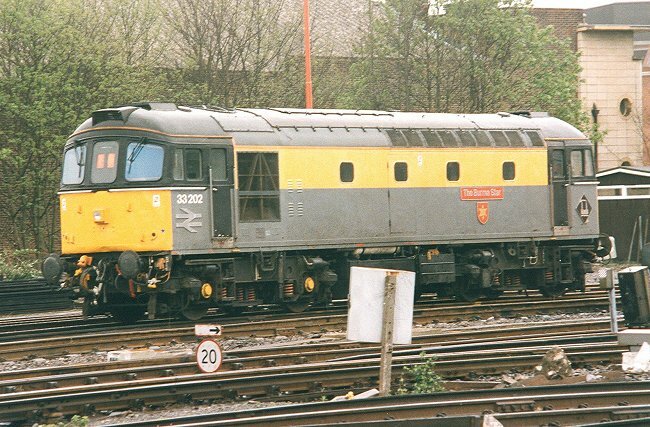 Class 33: 33202 "The Burma Star" at Redhill 1991. Built 1962 by BRCW works number DEL158 as D6587. 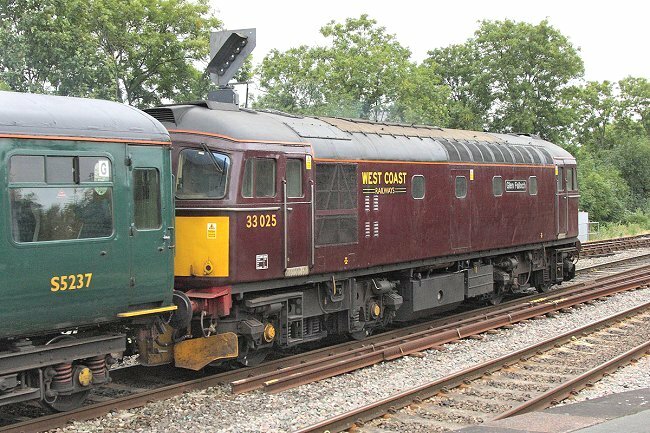 Class 33: 33025 in West Coast Railways livery at Maidenhead 26th August 2008. Built 1961 by BRCW works number DEL135 as D6543. Photograph Nick Broome. Class 33: 33002 in "Dutch" livery at Eastleigh 24th May 2009. 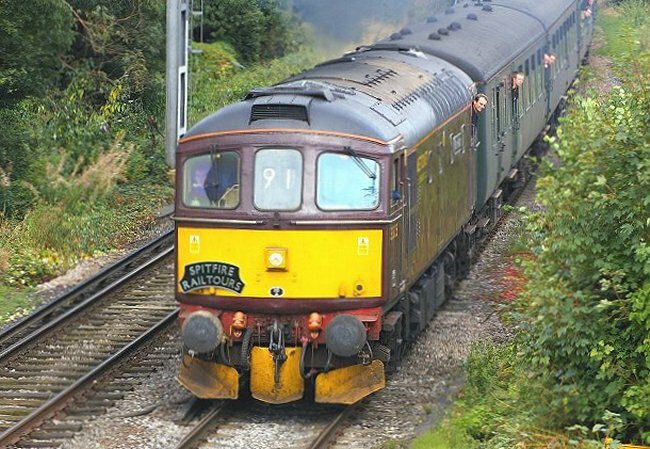 Built 1960 by BRCW works number DEL93 as D6501. Photograph Nick Broome.